Louis de Pointe du Lac, the Vampire Lestat's charismatic friend, is tortured by the memory the child Claudia whom he had loved and lost. To save his sanity, Louis appeals to Merrick, the beautiful, unconquerable witch descended from the Gread Mayfair clan whose extraordinary powers she has inherted. 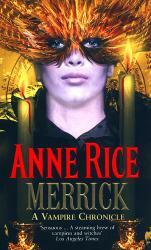 In this haunting tale, Merrick uses black witchcraft to call up the ghost of Claudia - however dangerous this may be. For there are other spirits who willl not lie still, and Merrick's search takes her close to the edge, through blood and terror, voodoo and violence.